Rubellite is a variety of elbaite, which is one of six members of the tourmaline group; the others being schorl (black), dravite (garnet redbrown), uvite (white), liddicoatite and buergerite. Elbaite can occur in any color ~ red, green, blue, yellow, purple, pink, etc. The focus here will be on Rubellite or "red tourmaline" which ranges from light pink to deep red in color. 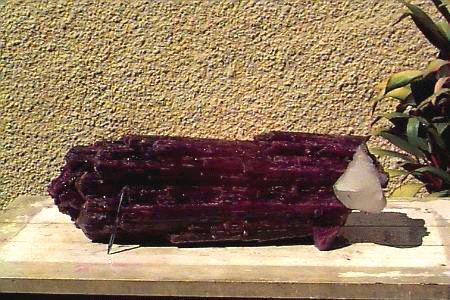 Rubellite commonly occurs in hexagonal, prismatic crystals, often very elongated with vertical striations, and can grow up to three feet in length. Easily distinguishable by a bulging triangular cross section, it is very hard (7  7.5) and heavy, with a conchoidal fracture. It is opaque to transparent with a vitreous luster. It is strongly piezoelectric and pyroelectric and can be charged electrically by heating and cooling. Rubellite does fracture easily across the crystal. Elbaite is a high-temperature and pressure mineral, forming in igneous and metamorphic rocks, and best developed in pegmatites, less often in high-temperature veins. It is made up of a series of compounds with varying quantities of sodium, calcium, magnesium, lithium, aluminum and iron but with a constant structure and content of Boron, aluminum, silica and the volatiles (B2O3 and Li2O). The finest elbaites are found in Elba (Italy) famous for its pink crystals, Minas Gerais (Brazil), the Urals (Russia) famous for its deep red crystals, Sri Lanka, Namibia, Madagascar, Mozambique, Newry (Maine), Kabul (Afghanistan), and Pala (CA), famous for its pink crystals. Some colored and transparent varieties of elbaite are sold as semiprecious stones. High pressure gauges make use of the mineral's piezoelectric properties. Traditionally, it is said that tourmaline dispels fear and negativity, calms the nerves, gives inspiration and dispels grief. Sensuality is softened, concentration and eloquence improve and balance is restored in relationships. Sleep is more tranquil. Blood poisoning, infectious diseases, consumption, anemia and lymphatic diseases are eased. All forms of tourmaline stimulate the biomagnetic, electrical and crystaline properties in the body. This electrical effect stimulates communication between the subtle bodies. Rubellite activates the psychospiritual properties of the second chakra. Diseases associated with the second chakra are eased while the meridians, nadis and subtle bodies of the second chakra are strengthened. As a thought amplifier, rubellite activates all the qualities and attributes stored in the second chakra. For instance, creativity and fertility are stimulated, and a too passive or aggressive nature is balanced. Rubellite specifically strengthens the heart and willpower, and manifests greater wisdom within the individual. It also releases free-flowing energy, enabling one to go with the normal flow of ones life, rather than to be in resistance to it. It can help one to relax and unwind.